Specially formulated to relieve the discomfort of Psoriasis, Eczema and itchy Scalps. 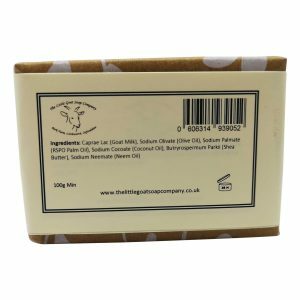 This bar contains a unique blend of Oils, including Neem and of course Raw Goats Milk. I got a sample bar of this for my husband to try as he suffers from psoriasis & many shampoos cause irritation. After one week of use, his red patches have calmed down completely. Now ordering the full size and hoping this reaction continues. When I wash my hair with usual shampoos and conditioners I get that feeling of weightless hair. After drying I have to put oils etc. to make it look good and be not frizzy. And it is totally uncontrollable.. After washing with this bar feels like hair ‘had a drink’ – weight is back, hair less frizzy and flexible again. If before I could not brush my hair without conditioning I can do it after just washing with this soap – no additional help needed. I found this bar in a little shop and having suffered from dry scalp, thought I’d give it a go. I washed my hair and conditioned it but it feels like I’ve still go soap in my hair, even after thorough rinsing. I am not entirely sure if I should just use this soap and nothing else, or if I should be washing it a different way, or perhaps rinsing it with something else (I’ve read apple cider vinegar with water might work). I’ve quite long hair and it feels matt, not silky so I’m unable to wear it down at the moment. It may just be a transitional period, but if anyone has got any advice, please could you let me know. 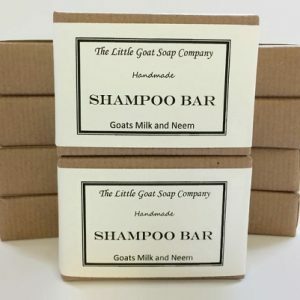 I think the idea is amazing (great for travelling) and I’m a big advocate of goats milk so really hope my hair adjusts. Having suffered from an itchy scalp for months and finding nothing helped ( not even medicated shampoo ) I decided to try your shampoo bar. I purchased the 5 small bar multipack to try the shampoo and some other ‘ flavours ‘. I cannot tell you how pleased I am with the results!! I have used it for two weeks and can honestly say that the itch has, although not completely gone reduced by at least 90%. I love how it leaves my hair feeling clean and beautifully soft without the need for conditioner ( which I don’t like using ) or leaving it fly away!! I am about to purchase a full sized bar. I so wish I’d tried this when I found your site ages ago!! Thanks! 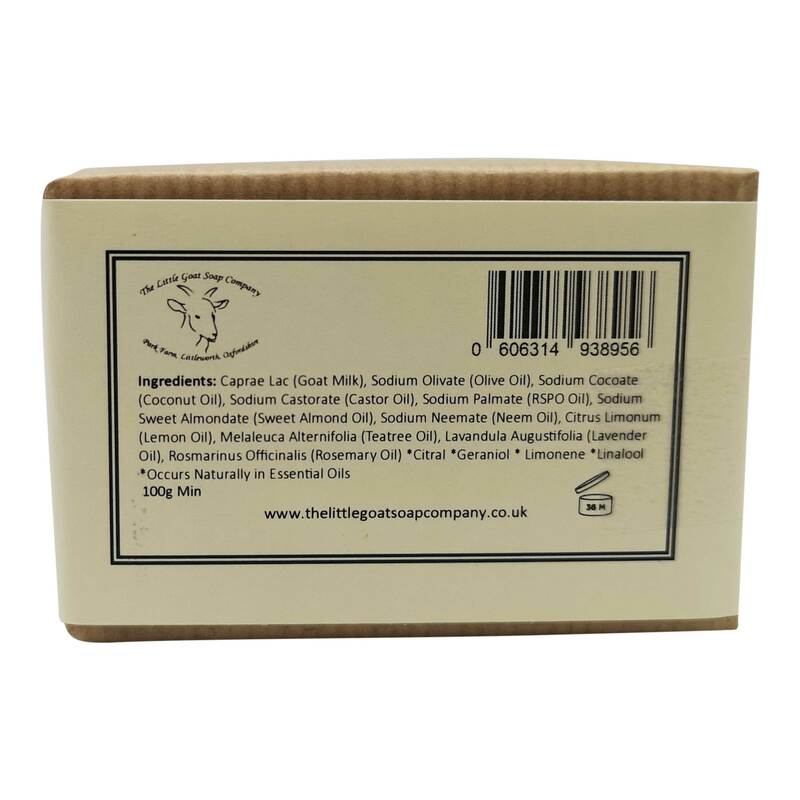 I love this shampoo bar, it actually works and leaves my hair feeling clean and soft, I have had a problem with my hair with dry itchy spots and dandruff and this shampoo has got rid of it, so thank you. This is reasonably priced as I have bought rather expensive shampoos before with no help at all and it lasts a long time. I have purchased and used the shampoo bar, is there a knack to using it . Do you wash once or twice, it has a conditioning feel to it . I can only wear my hair up at the moment and it looks fine but to blow dry it in a bob isn’t quite working it feels waxy. I am guessing this is a transitional stage as it rids my hair of other products. Has anyone else experienced this. Love the soaps and want to get my hair in good condition. maybe this is its natural feel and we have just got use to it feeling dry. I will continue and see if it improves. I’ve been using cold pressed soaps for months now and this is officially my favourite. My hair seems to really get along with it, and it doesn’t leave it gunky or filled with residue despite my hard water. It smells wonderful, too. I noticed a few people asking after experiences with shampoo bars, and I’m hoping I can help a bit. If you’re switching straight from normal shampoo (tresemee, garnier, pantene, no name brands – anything with Sodium Laurel Sulphate, parabens, and silicones) you hair will need to adjust. The waxy feeling is your hair adjusting to not being stripped of natural oils. Dependent on your water hardness and how damaged your hair is, it can take anywhere from a week (like me) or longer to adjust. Some people choose to use a diluted acidic rinse with cold pressed shampoo bars (apple cider vinegar, white vinegar and lemon juice are popular – usually a tsp to a cup of water) and it can help with the transition. Google is your friend, there’re facebook groups too. This bar is brilliant! I found with my previous brand that the bar gunked up my hair after the second wash but this is still leaving my hair clean and soft! I part my hair horizontally from back to front and rub the lather into the parting, flipping the hair back as I go. I massage my scalp, and push the lather through the ends without rubbing, but focus on any areas I know get greasy and that’s enough to clean it. I make sure to rinse thoroughly and air dry – voila, gorgeous waves and healthy hair. I’m very, very pleased with this bar! This shampoo is awesome. I can wash my hair with shampoo bar and my hair is clean and soft with no need for conditioner. I will never wash my hair in anything else now. I was looking for a shampoo without any of the harsh ingredients in regular shampoo. I’ve seen the benefits of goat’s milk on people who have eczema, and digestive problems, so I wanted to try this. By the third use, I have to say wow! My hair has never looked better. The best thing about this product is it does not strip your hair of its natural oils, so you don’t need conditioner. At first my hair did feel a bit weird and kind of sticky, but like I say after a few shampoos, my hair has adjusted to it, and now looks great – no conditioner required! I have thick, long, fairly coarse, dry hair, and suffer from flaky scalp before using this – not anymore, thank you so much for making this shampoo! I have used the shampoo soap for about a week and unfortunately did not find it helpful to my psoriasis. I have had an especially bad flare up and therefore did require a prescription for something stronger. I think I will go back to trying the shampoo soap once the flare up is under control. I am sensitive to essential oils so cannot use the soap whilst my psoriasis is acute. I did find that my hair was left with soap residue, but did not mind this too much. I have a very complex combination of hair/scalp issues (dry ends, oily roots, scalp psoriasis), and my hair is also frizzy, thick, and curly. Lots of shampoos just don’t target all the areas I need them to, even expensive ones only give me around 60% improvement. This shampoo bar is a miracle! From the very first wash, my hair felt cleaner, my curls were more defined, and my roots and ends were both perfect! It feels like the shampoo bar adds back the natural goodness into your hair that normal shampoos strip away, and my hair feels like it doesn’t absorb moisture as easily and dries really quickly! Another amazing benefit I’ve noticed is that my hair looks better for much longer, so now I only have to wash my hair twice a week rather than every other day like I have had to do for years! I don’t need to use any conditioner either! I would definitely recommend this shampoo bar, it has saved me a fortune in fancy specialist hair products! I trialled this shampoo soap in a guest set of 5. Having stopped using regular shampoo and conditioner because of the additives and using only water, although my hair got used to this system, I wanted something to give it a lift now and again. This is brilliant. Leaves my hair looking really shiny and full of body and it doesn’t seem to strip out the natural oils. I love it. I was really looking forward to trying this but have struggled with it. It has left my hair feeling really sticky and extremely greasy. Maybe I just need some time to adjust and persevere for a bit longer. I was a bit of a doubter when I brought this soap, “shampoo soap! how’s that going to work” but my daughter persuaded me as we are both psoriasis suffers and she has been suffering with greasy hair too. Well I’ll eat my words. I used this on her as my Guinea Pig and wow, it lathered up a treat and rinsed out to leave squeaky clean hair. She has long hair and it rinsed out easily, and the shine when its dry, unbelievable. Needless to say I’m using it and my other daughter has sneaked a couple of washes too. I’ve now purchased a bulk pack and have no intention of going back to conventional shampoo. I would definitely recommend this product. Really really happy with this little shampoo bar. I tried a different one previously and it left too much residue on my hair. Albeit it was early days, but I read the reviews about this one and as I have a sensitive scalp, I thought I’d give it a try. Honestly, my hair hasn’t been so nice in years! As a blonde with long, thin hair, and constantly dying it, it was in bad condition. But it feels really smooth now and I feel like it’s slowly fixing my locks. Once a week I add Apple Cider Vinegar, and to start with I let it go greasy on the third day. I brushed through my hair regularly to make sure the natural oils spread to my dry ends. If you can’t cope with greasy hair, then you can add a little spelt or cornflour and it does the trick for a day so you don’t have to overwash your hair. I still put a little coconut oil or argan oil on the very ends because my hair was in quite a bad condition. But the shampoo bar has done most of the work. I used to really struggle and get really knotty hair and now it’s really smooth. Whilst my scalp is still a little sensitive, it’s really gentle on my hair, so hopefully, after a few more weeks it will clear it up completely. They also added in a free mini soap bar, which smells delightful and is delicate on my skin. Thank you so much! I’m converted and no more plastic! I love this shampoo bar. Just coming to the end of my first bar and have just bought more already. I was really cautious at first weaning myself off my medicated shampoo but now I use it all the time and love it. As a soap it’s fine with natural ingredients, but not for shampoo! It does not rinse off and makes hair very sticky and waxy. I read in some of the comments saying that’s a transition period, but that’s not true, I’ve used other bars that have much better results. This is just not for hair shampoo! I’ve struggled with this one too- I’ve been using various shampoo bars for a year now, but this one doesn’t leave my hair/scalp clean,agree with reviewer above that my hair is left feeling “waxy”. On the positive side, it smells lovely and left hair very soft to the point that I stopped using conditioner, but on the negative side my hair has never been greasier! I’ve been using it for two months now, so not a transition period. My hair is thick and curly, maybe it works differently on finer hair. I was a bit sceptical about shampoo bars, especially not using conditioner but gave it a try as I was finding liquid shampoo wasn’t agreeing with me. I did experience the slight ‘sticky’ phase as many people describe but found a vinegar rinse sorted that quite quickly (about 3 washes before I didn’t need it anymore). My hair is now soft and shiny and I have even had comments on it looking so good. Look forward to trying some of the other products. I had been struggling with dandruff that just wouldn’t go away. I bought the shampoo soap when they were at the Oxford market and it helped so much. After a couple of weeks of usage the dandruff was gone. I initially tried this soap in a bid to reduce the plastic I bring into my home. I looked at a lot of shampoo bars, choosing this one thinking it would be beneficial as I have a tendency towards a dry and itchy scalp. I have nearly finished up the first bar I bought and I can report that since using it my scalp is healthier, I seem to be experiencing less hair loss and my hair looks glossier and fuller. I also can go 3-4 days between washes as opposed to every other day. Learning how to use bar shampoo was definitely a challenge for the first few washes. I’ve worked out the best way for my shoulder length, fine hair is to apply to the wet scalp and section off my hair with my fingers and working in the same direction as my hair. I then massage my scalp well for 1-2 minutes. I don’t use conditioner any more. Instead, I rinse with cider vinegar (1-2 capfuls in a basin or jug of lukewarm water), which leaves my hair manageable. I live in an area with extremely hard water so the vinegar rinse is essential. I’ve used the soap in soft water and there is a massive difference in how my hair feels after washing. That said, I would still do the vinegar rinse. Yes, it does smell after washing but once my hair has dried the smell vanishes. I’m so happy with this shampoo I’ve just ordered 10 more bars. Couldn’t wait to try this and get rid of the branded, plastic stuff we’re currently using. And it didn’t disappoint! Really happy I’ve found this company. They’re making natural products in non-plastic packaging. It’s made a big difference to my hair. Everything feels a lot more natural, cleaner and thicker. We’re trying to move away from plastic, chemicals, non-recyclable, and reduce our footprint on the earth. And the goats are happy too! So, thank you. When I decided to reduce using products in plastic, I found this website and I decided to give the shampoo bar a try. It’s amazing!! I was always being fussy with shampoos and I always needed to use conditioner (my hair are long and really a lot!). I was worried about the eventual transition period but since the fist time I used this shampoo bar my hair seemed more healthy, voluminous, thick and soft! Even without conditioner (for me it’s a dream coming true!). Also my partner noticed the difference straight away! Plus I really love the smell. I would definitively recommend this product!